I am Raymond McCumber born and raised in San Antonio, TX. I graduated high school from Converse Judson in 2007 and from there earned my BS in athletic training from Texas State University C/O 2016. I am a certified athletic trainer from the BOC as well as licensed in the state of Texas, I also am a CPR instructor by the AHA. 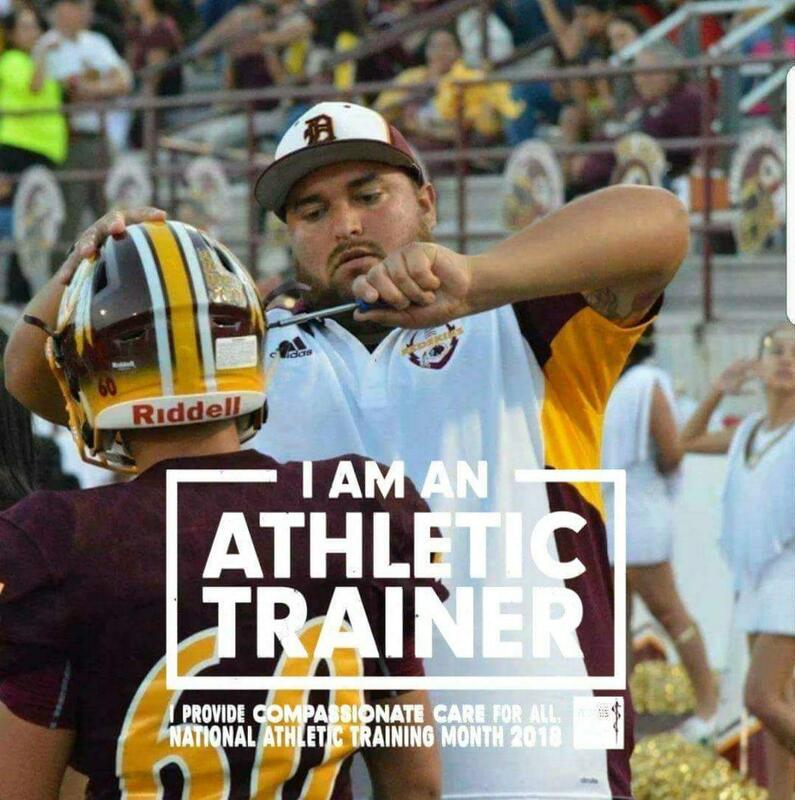 Currently I reside in McAllen and work for Donna High School finishing up my third year as an athletic trainer. Growing up I always had an interest in the medical field and had thought of working in a sports medicine clinic as a career, so at first my major at Tx St was pre-pt. While I was at Judson I played football and at the time our athletic trainer was not really utilized like we are today, and I never really got hurt or spent much time in the training room. So naturally I didn't know too much about the field of athletic training. All I knew was that I wanted to be in a health profession and work with athletes because my drive to still be in the sports world was there. After a few years in school, pre-pt was not working out so my counselor directed me to switch my major to athletic training which was a big turning point in my life. After taking a class called orientation to athletic training, thank you Mrs. Webb, I was hooked and was an eye opening moment. I thought to myselft that this is what I've been wanting to do the whole time and the rest is history. I still love and have so much passion for my job and switching my major was one of the best decisions I've made in my life. During the spring of 2016 I was looking around for job openings and because I didn't have a teaching cert, my options were somewhat limited. At the time I was in my high school rotation at Canyon Lake HS and Israel Pena told me why don't I look into the valley. I was told the pay is good and I will get a lot of experience down here and he was right. During that time there was a ton of job openings in the RGV so I just started applying and Donna was the first school to offer me. First off my love and passion for this job is what drives me. I'm so thankful waking up in the morning and going to "work", some days are mentally taxing but the love and deisre makes it all worth it. Another thing that drives me is knowing that these athletes are relying on you. I try to give them some structure and help them be more responsible, accountable, and set a foundation to have good character. My goal is to get these athletes back and better than what they were before an injury which doesn't always happen, but if they see your effort and drive it makes them work that much harder. Lastly, the rewarding feeling of always being there for them even its just listening and having someone to talk to, or seeing them at their weakest point due to injury, and seeing them achieve their goals. Whether is returning to their normal ADLs or to the field, court, etc. During my time in undergrad I was able to travel with the football team and the basketball team which was exciting. At the high school setting not so much, but I do get to travel for some playoff games and track if they make it to regionals. Some advice I have is if you are a ATS and plan on working at the high school setting is to get your teacher cert during your undergrad, this is a big deal when it comes to the hiring process. Another thing, especially if you are fresh out of school is to take if one day at a time. Some days will be exhausting and others will be a breeze, but learning to turn the page on the tough times and leaving work at work, don't bring it home. Also, being that we would love to help everyone and do our absolute best with all athletes, sometimes it is not possible especially at bigger schools with a ton of athletes. Learning to go with it and letting things go are big, somethings are out of our control. Another thing I will say is that you are going to make mistakes, every one does, just remain confident in your skills and continue to learn. Don't make the same mistake twice, and keeping good communication with your AD, coaches, and parents will make your life a lot easier.